Good Luck to everyone that applies! Javier Salas Mendez is currently attending John F. Kennedy HS. He is currently the President of National Technical Honor Society, the President of the Mathematics Honor Society, a member of the National Honor Society and the Emerald Battalion Command Sergeant Major of Junior Army Reserve Officer Training Corps to name a few. 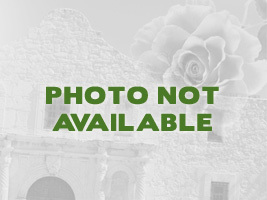 He has volunteered for the San Antonio Habitat for Humanity, Snack Pak 4 kids and the San Antonio Food Bank. He is planning to attend Texas A&M University, College Station with a major in Business Administration. He would like to provide affordable Health Care for his community. 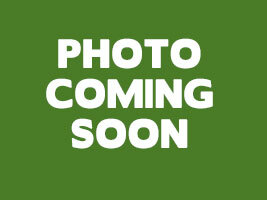 John S. Hodge is currently attending Boerne HS. 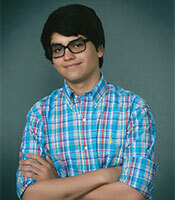 He is a member of Boerne HS Choir, where he achieved Texas All State Choir, 1 st chair bass. He is also a member if National Honor Society, Boerne Community Theater and Boerne HS Environmental Club where is has served as Treasurer. 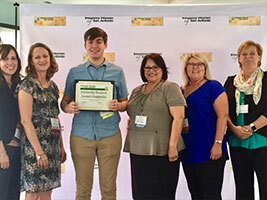 He has volunteered at Hill Country Daily Bread Ministries, Cibolo Nature Center and High school sporting events with Boerne Choir. 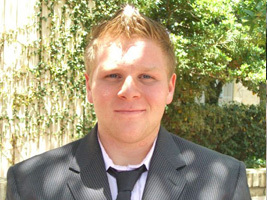 He as offered two internships in Japan his Junior year with Yamazaki Mazak Corporation and Brother Industries. This summer, he will intern with a renewable energy contractor. He is planning on attending the University of Texas in Austin with a major in International Business. He would like to own his own renewable energy company at an international level. Alicia Rose Ambler is currently attending Travis Early College HS. 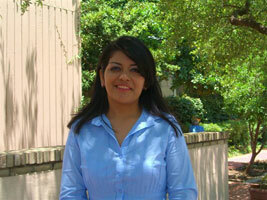 She has attended several summer programs at UTSA, San Antonio College and St. Mary’s University. She has volunteered at Kym’s Kids Youth Program and Monte Vista Historical Association. She has already completed 33 college hours and 160 hours of community service. 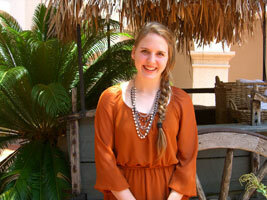 She has interned at the Texas Department of Transportation and has had multiple summer jobs throughout her HS career. She will attend Sam Houston State University with a major in Business; She would like to focus in Market Analysis with a minor is media studies. Taylor Lynn Hamilton is currently attending East Central HS. She is a member of FFA where she raises and shows pigs. She is on the Agricultural Skills Demonstration Team and earned a varsity letter for placing at the State Livestock Judging competition at Texas A&amp;M University. She earned the Lone Star FFA Degree and was elected FFA Sweetheart. She a member of the National Honor Society, band and softball team. 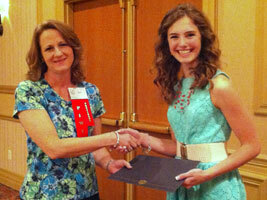 She was selected to represent East Central HS this past summer at Girls State. She has devoted countless community service hours in organizations off campus such as her church and local fire department. She will be attending Texas Lutheran University this fall with a major in Accounting. Madelyn Hornburg is currently attending Smithson Valley HS. She is a member of FCCLA, which is Family, Career and Community Leaders of America, Student Council and National Honors Society. She has completed over 200 service hours in her high school career. She did a 2 week mission trip to Guatemala where she helped install water filters and built stoves in 36 homes and 2 schools. She will be attending Texas A&amp;M University, College Station and take part of their five year masters program for accounting. She is planning to get a minor in forensic science and pursue a career in forensic accounting. Jared Michael Chappelle is currently attending Smithson Valley HS. He is an Eagle Scout, serving as Assistant Patrol Leader and Senior Patrol Leader, which are the highest leadership positions in Scouting. He is also a member of the Ranger marching and concert band where he is currently 1st chair saxophone, and earned 1 st division rating at Solo & Ensemble this year. He is also part of the Cyberpatriots team. He is plans to attend UTSA and majoring in Accounting. He would like to become a CPA. Hayley Stroud is currently attending New Braunfels HS. She is currently President of National Honor Society, Secretary of Business Professionals of America, a member of New Braunfels HS Safety committee and spirit club. Her academic awards include All State and All District. 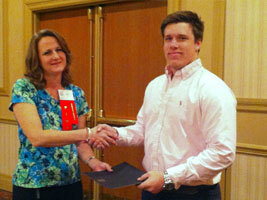 Business Professionals of America Regional and State Qualifier in interview skills. She is planning to attend Texas A&M University, College Station, with a degree in Marketing with a minor in Non-Profit Organizations. She dreams of creating her own foundation which focuses on aiding women and children in underdeveloped countries. Melanie Kadrmas is currently attending La Vernia HS. 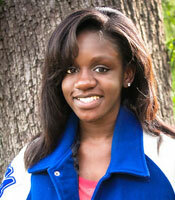 She is a Varsity Cheerleader, where she has earned Academic All State, only 40 selected in the State of Texas. She has been a member of the Varsity Cheer Leadership Council since 2015 and a member of National Honor Society. She has volunteered for Kinetic Kids and Southside Heritage Elementary School. This summer, she is planning to work for the National Cheerleading Association as a staff member for HS cheerleading camps. She is been accepted into the Mays Business School at Texas A&M University, College Station. Her focus will be a major in Accounting. She would like to become an actuary. Grace Flynn is currently attending Antonian College Preparatory HS. She is Student Council President of her senior class. A member of her school’s Action Team, Drama Club and swim team. She is also a member if the National Honor Society, Spanish Honor Society and Mathematics Honor Society. She will attend Southern Methodist University and pursue a degree in Business Administration and a masters in Accounting. Jorge Albarracin is currently attending Clark HS. 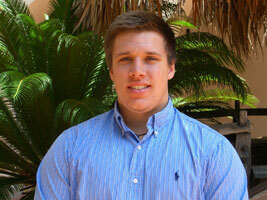 He is a member of the Varsity Tennis team, Key Club, National Honor Society and the Spanish Honor Society. He volunteers at his church youth group, Taking to the Streets and SNIPSA. He plans on attending either Texas A&M, College Station or Texas State University with a degree in International Business and Global Relations. Katie plans of attending Austin Community College where she will pursue a career as a forensic accountant. Ashley plans on attending Texas A&M University, majoring in Business and Marketing. Kasinda plans on attending St. Mary’s University majoring in Finance. Jeffery plans on attending the University of Texas in Austin where he will pursue a major in Accounting and Finance. Gareth will attend Schreiner University in Kerrville majoring in Business. Graduate of Samuel Clemens High School and will be attending The University of Texas at Austin working on her business degree with honors. Currently a freshman at Abilene Christian University where he is a dual major in Business Management and Marketing and is on the Dean's list. Graduate of Winston Churchill High School and will be attending The University of Texas at Austin at the McCombs School of Business. Graduate of Smithson Valley High School and will be attending Texas State University studying Marketing and Finance. Graduate of Communications Arts High School and will be attending The University of Texas at San Antonio pursuing a degree in Business Administration and Cyber Security. 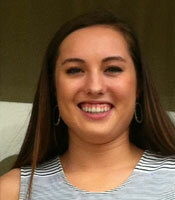 Angela is from Navarro High School in Seguin, TX and is ranked 11 of 118 in her class. She is President of Student Council, President of National Honor Society and a Leader in Band. 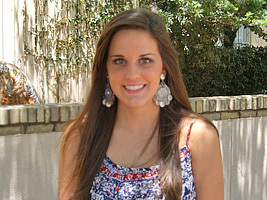 She plans to attend Texas A&M and major in Business Administration. 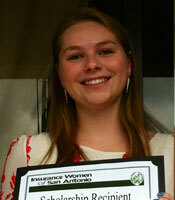 Lauren is from Winston Churchill High School in San Antonio and is ranked 16 out of 703 in her class. She is a member of the National Honor Society, Spanish Honor Society and is a choir section leader. She will major in Finance at the University of Texas at Austin. Pep Squad officer and the Get Real Pro-Life Club. She will study Business Administration at Texas A&M University. 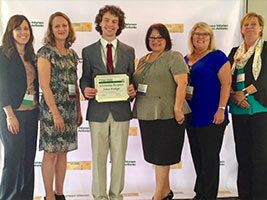 National Honor Society and is the Winner's Circle Drug & Alcohol Free Historian. She will attend Texas A&M University and major in Human Resources. 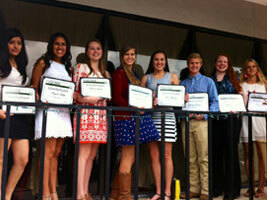 National Honor Society, Winners Circle and Bully Guard. Blake will major in Business at Texas A&M University. 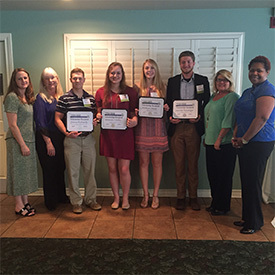 National Honor Society, Spanish National Honor Society and serves on the Board of Directors of the Girl Scouts. She will major in economics at the University of Texas at Austin. 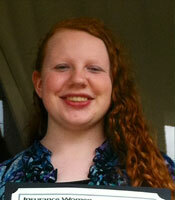 Kelci attends O'Connor High School in San Antonio and is ranked 125 out of 743 in her class. She is an active member of FFA and 4H and a member of the National Honor Society and MU Alpha Theta. She will attend Tarleton State University majoring in Agribusiness. 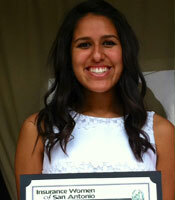 Sara attends Churchill High School in San Antonio, is ranked #22 of 703. She is on the Varsity swim Team, Varsity Choir, a class officer and a member of the National Honor Society, Savrola Literary Club, and Eco Club. She will attend Texas A&M University in their Business Honors & Business Administration program. 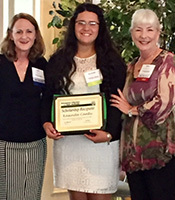 Gabrielle attends MacArthur High School in San Antonio, is ranked #63 of 631 in her class. She is active in the Jr ROTC, MacTeach tutor & mentoring program and Varsity Symphony. She’s a member of National French Honor Society, National Honor Society, FBLA, National Society of Black Engineers and TX Music Educators Assoc. She will attend Baylor University and major in marketing. Honor Society, VP of her Senior Class and Spanish Club. She will major in Business and Banking and the University of Incarnate Word. 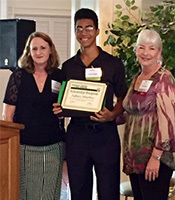 Mauricio is a senior at Somerset High School; he is ranked #1 out of 205 students. All throughout high school, he has taken numerous Honors, Pre-AP, AP, and Dual Credit Courses, while balancing hours of community service, and holding leadership positions in Student Council, National Honor Society, Class Representatives and the UIL Academic Team. Mauricio will be attending the University of Texas at Austin where he will be Majoring in International Business within the McCombs School of Business. 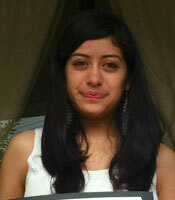 Paula will be graduating from Smithson Valley High School where she is ranked 21 out of 505 students. With the exception of just a few courses, the remaining have been Pre-AP, AP or Dual Credit courses throughout her high school career. Paula’s passion is helping people and she has obtained over 400 hours of community service. She plans to attend the University of Texas at Austin with a goal of obtaining a Bachelor’s degree with a Major in Communication and a Minor in Business Management. 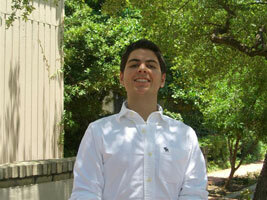 Stephen is a senior at Antonian College Prep High School. 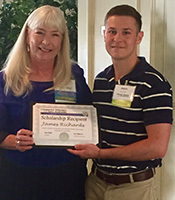 He has taken a number of Honors courses and spent numerous hours performing community service work, including “Meals on Wheels” during the summer months and on Thanksgiving Day. Among others, Stephen is a member of the baseball team, Latin club, Spirit club, and the Mu Alpha Theta Math Honor Society. He will attend Texas A&M University where he plans on obtaining his Bachelor’s degree in Business before going on to law school to specialize in Corporate Law. Stephen aspires to open his own firm which he attributes to the influence his father has had on his life. 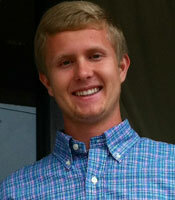 Cole is a graduate of Smithson Valley High School and he is now attending Abilene Christian University . He is a member of the ACU College Republicans, the ACU Student Accounting Organization, a student member of the AICPA, (American Institute of Public Accountants) and a student member of the NSA, (National Society of Accountants). He participates in food drives, the Habitat for Humanity and still finds time for intramural football. Cole is currently working on his Bachelors’ Degree with a Major in Accounting. 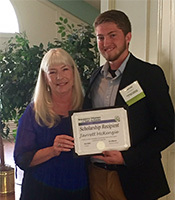 Cole is a second time recipient of this scholarship. Lauren will be graduating from Smithson Valley High School. She has been actively involved in the Silver Spurs Dance Team, Student Council, Debate Team, Spanish Club, and the Girl Scouts of Southwest Texas where she held the “Girl Board Chair” (the first such position in the USA) where she had the privilege of representing over 23,000 girls in its 21-county jurisdiction. All the while, Lauren has taken numerous Pre-AP and AP classes. 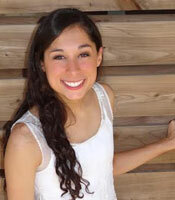 Lauren plans to attend the University of Houston and aims to earn two Bachelor’s degrees (one in Entrepreneurship and one in Kinesiology) and later a Master’s in Business Administration and a PhD in Kinesiology. 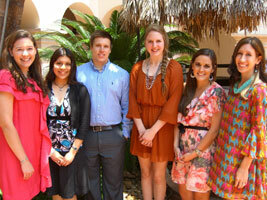 Three of the 2013 Scholarship Winners and President Elect Liz Dunn and President April Massey. 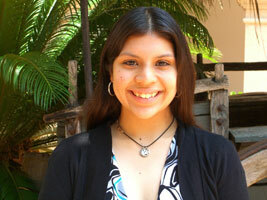 Luz is a senior at Harlandale High School; she is ranked 13 out of 384. 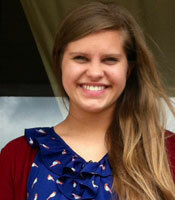 She has taken a number of Pre-AP and Dual Credit courses. Luz is a member of the band at Harlandale, the National Honor Society and has been a participant in the Trinity University's Upward Bound Program. She will attend Texas A&M University in Corpus Christi where she plans on earning both her Undergraduate and Master's degree in Accounting within five years. Cole is graduating from Smithson Valley High School. He is a member of the National Honor Society, Fellowship of Christian Athletes, Family & Community Services and Smithson Valley Varsity Football Team to just name a few of his school and community activities. Cole's plans are to attend Abilene Christian University and major in Business Administration and maybe a minor in music. 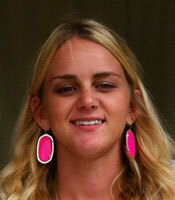 Jennifer is a senior at Canyon High School; she is ranked 10 out of 401. 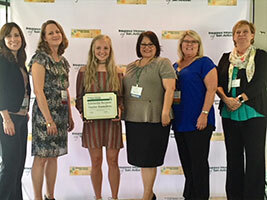 Her extra-curricular activities and community services have been done as a member of Canyon High School's dance team and the National Honor Society along with 4-H and Key Club. Jennifer will be attending the University of Texas at Austin where she will be studying for a Major in Business/Accounting. Cassidy has just finished her freshman year at Mays Business School at Texas A&M University. 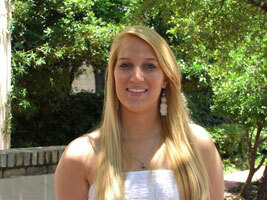 Her volunteer work and extracurricular activities have continued at Texas A&M. 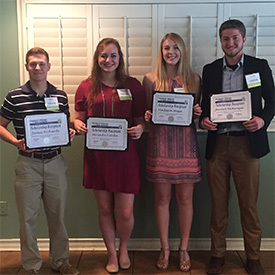 In April she was inducted as a member of the Phi Eta Sigma National Honor Society, only freshmen with a GPA of 3.5 or higher were considered. 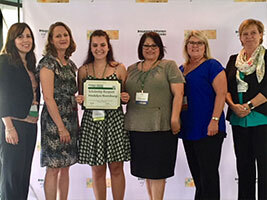 Cassidy aims to receive a degree in Accounting. 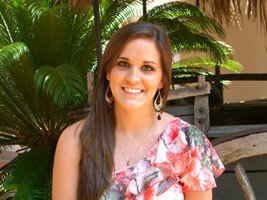 She is working to receive her Bachelor's and Master's degree in five years. 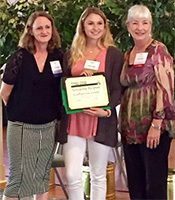 Cassidy is a second time recipient of this scholarship. Sarah will be a sophomore at St. Mary's University next year, where she earned her spot on the Dean's Highest Honors List her first semester of college. Her goal is to obtain a Bachelor's degree in Business. She is looking at a few majors that she would like to specialize in, including Applied Management, Information Systems Management or Management. 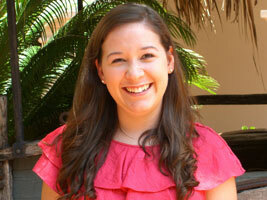 Sarah has a passion for community service through volunteering. 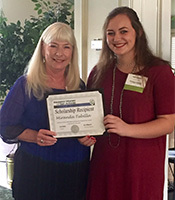 She was selected to be a member of the Marianist Leadership Program (LMP), a program of student servant leaders working to live out the Marianist Charism through faith and service. 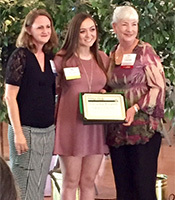 Sarah is also a second time recipient winner for this scholarship. 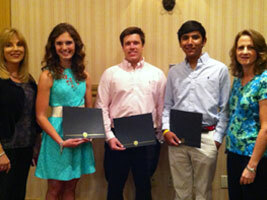 2012 Scholarship Winners and Jackie Townsend Lackey, Presenter & Former IWSA/FIWT Scholarship Winner. Skyler is a senior at McCollum High School. This year she will graduate number 28 out of 361, already having earned 24 college hours at the McCollum School of Leadership. Skyler has been busy with cheerleading, athletics, academics, and volunteering throughout her 4 years of high school, becoming cheer captain her senior year. She is a member of the National Honor Society, the American Sign Language Club, and the National Technical Honor Society. As if all of those accomplishments were not enough, she also started her own business at age 15 as a Hannah Montana impersonator. She has 6 employees, one of whom is a Justin Bieber impersonator. 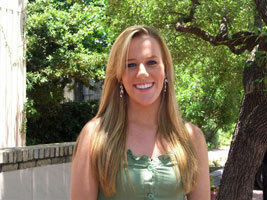 She plans to earn her Masters Degree in Business at Texas State University. Chris is graduating from Judson High School, has chosen a dual major in business and architectural engineering. Although this sounds ambitious, it somehow seems appropriate for a young man graduating 8th in a class of 660. Over the past 4 years Chris volunteered at the Special Olympics and at Santa’s Rolling Reindeer. His athletic accomplishments include being on the varsity track team, varsity wrestling team, as well as the varsity football team, where he was the Varsity Captain. Chris also participated in a peer mediating program and he still managed to work part time after school. Until his senior year when he began working 40 hours per week. Cassidy is graduating as Valedictorian this year from Bandera High School. She participated in track and soccer, earning the position of Team Captain in Soccer. She is also an accomplished artist and pianist, having earned 1st place medals for her artwork and the National Federation of Music Award for ranking Superior for 3 years as a piano soloist. She has been a spiritual and guidance leader at two retreats through her church, St. Stanislaus Church. Cassidy plans to major in business at Texas A & M University. Sarah is a senior at Winston Churchill High Shool. 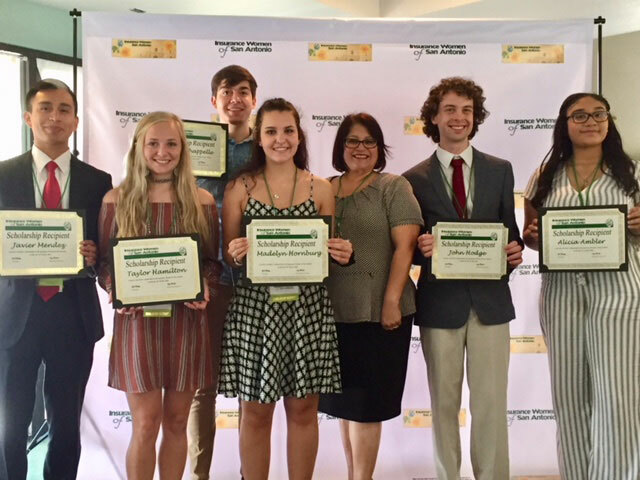 She is a member of the National Honor Society, a recipient of the President’s Volunteer Service Award, co-editor of her school yearbook, and has been a group leader at St. Matthews Catholic Church Youth Group. Her list of volunteer and community activities is 7 pages long. To say that she is a born leader seems an understatement. She has also worked part time throughout high school. She plans to obtain a degree in Business Management, hopefully at St. Mary’s University, and perhaps start her own business some day. Joshua attends Business Careers High School located on the campus of Oliver Wendell Holmes High School. He is graduating 6th out of a class of 506, is active in the athletic program, is a member of the National Honor Society, and has held part-time jobs all through high school. Valerie Jackson graduated from Douglas MacArthur HS in 2008 and is currently a sophomore at the University of the Incarnate Word pursing her Business Degree. 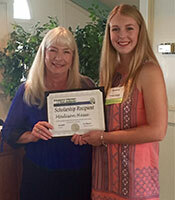 Valerie was chosen as a scholarship recipient for her obvious dedication to her education and her community. 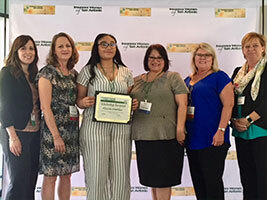 She has a job in the afternoon as a counselor for the after school program at Redland Oaks Elementary and volunteers much of her time on a regular basis. In fact, she has so much volunteer experience, we would be here all day if I tried to list them all. Let me just say, her resume of accomplishments and community involvement are very impressive! Congratulations Valerie! her last two years of Soccer her team won both the Western District and State Championships. While playing Soccer, volunteering her time, working part time at a grocery store and participating in FFA raising chickens, she has been able to maintain a 92 grade point average. Avery plans to attend Texas State University in San Marcos where she will pursue a degree in business management. Congratulations Avery! biography. “Hispanic women aren’t meant to go to College” barks my grandfather every time he sees me studying. He grew up in a family where he was taught that Hispanic women are meant to stay home and raise a family. His sermons about how my grandmother and all the women in my family didn’t go to school were convincing until one day when he said “it’s the cycle of the Hispanic women”. That’s when my way of thinking changed completely. And change she did. Michelle is ranked 1st in her class of 301 with a grade point average of 101.5. She has served as National Honor Society Vice President, National Technical Honor Society president, math club treasure, student counsel vice president, Spanish club vice president, yearbook editor and class officer historian. Michelle plans to attend Trinity University in the fall where she will major in Business Law. Congratulations Michelle! School. He and his family are originally from Mexico so he has had the challenge of learning a second language as well as adjusting to a completely different life style. 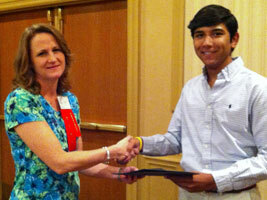 He is a member of Family and Consumer Sciences, Spanish Club, Business Professionals of America and Student Council. He has also volunteered at school tutoring ESL students, and helped to organize the Special Olympics for special needs students at his school. 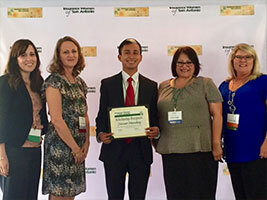 Victor plans on attending UTSA in the fall where he will major in Business Administration. Congratulations Victor! 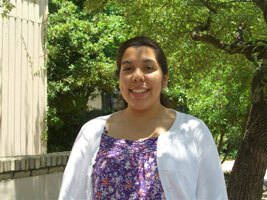 Trisha Garza is a Senior at Brackenridge High School. She has an overall 92 grade point average and is ranked 69th in a class of 414 students. Along with excellent grades, Trisha has stayed active in school playing on the Varsity Basketball team, Varsity Track& Field and is a Student Council Officer. Trisha volunteers much of her time and is very involved at her Church. Dream Big, Live Big is her motto in life. Trisha is planning to go to UTSA in the fall to Major in Business Management. Congratulations Trisha.